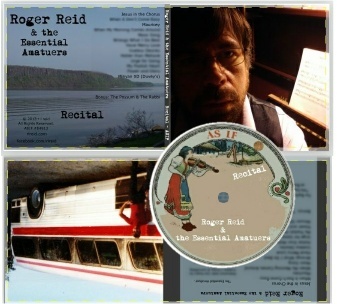 From "Recital", by Roger Reid and the Essential Amateurs. (May 2013 Preview from the soon to be released album "Recital"
Not the final edit for Jesus in the Chorus, but close. A title suggested by Alan Fendler (musicologist, re-enactor, ba'al koreh, and judge of good whiskey), though apparently in jest. The midland accent is an affectaction though I come by it honestly. The core of Recital is a trilogy of stories in song about "country" Jews that I wrote in 2008/2009. They just kind of happened, though in each case there was a spark. Jesus in the Chorus as stated, was a reaction one Sunday morning after 2.5 hours watching CMT. I usually enjoy it but that day there was one too many songs adding a flag, a little white church (that "everyone" belongs to), or a wounded veteran - with no actual relation to the song. Note to Christian friends: The hero's justification is fairly disingenuous, historically and theologically. The song is not a statement on the Christian messiah. Mauricey may be the only song ever written that contains both the phrases "vertical integration" and "consolidated agri-industry". In conversation with someone at shul, we discovered we were both from South Jersey. He grew up in the remnant of one of the towns that evolved from the Jewish farming movement dreamed up by well meaning rich folk to save the poor ones fleeing Europe. The name "Mauricey" is fictional, and taken from the Maurice River. Minimum is an epic piece, and another fictional town. It is inspired by the screenplay "Minimum" by Rachel A. Levine, whose work of historical fiction takes place in the town of Minimum. It had been named "Minyan" by the Jews who settled in the late 1880's. But things have changed and folks tend to call the town Minimum, and now, in the 1970's the name is changed officially to Minimum. This isn't a dancable 4 minute number, and takes some focus, which is why it's the last song on the record. The other tunes on "Recital" are covers of songs I like to sing, by Phil Ochs, Janis Ian, Patty Griffin, and others. It should be available mid-summer.